Toojay’s has recently released new entrees and are now offering 50% off entree coupons so you can try out something new from their menu. What’s new? Well, here’s some of the amazing entrees that have been recently added to the TooJay’s list of deliciously decadent menu items. Experience the cheesy gourmet Grilled Cheese with arugula and avocado. Next up on the menu is the one of a kind, cranberry almond salad topped with grilled chicken breast, cranraisins, toasted almonds and Gorgonzola. And one last preview food item you’ll find on the menu is the Turkey Avocado Wrap featuring fresh avocado, arugula, tomato and lemon garlic aioli. And when you head on down to your local TooJay’s you’ll discover tons of more new entrees to choose from. 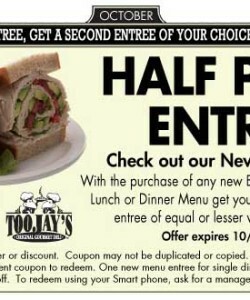 So use this TooJay’s coupon to BOGO also known as Buy One Get One Half Off. So even though you get one entree half off, you could also think of it as get two entree’s 25% off. 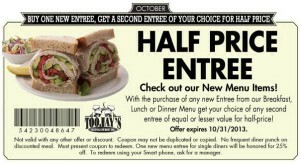 But make sure you purchase a brand new entree item otherwise the coupon is not valid. Eat, drink and be merry at the one and only TooJay’s this month and enjoy a free new entree courtesy of TooJays!